Women’s rights campaigners in Fiji are calling for half of the country’s political positions to be reserved for women. The Fiji Women Rights Movement and the Women’s Crisis centre called for the change in its submission to the Constitution Commission. The movement’s program officer Tara Chetty has told Radio Australia’s Pacific Beat Fiji is not alone in its gender imbalance. “Fiji, as well as the rest of the Pacific, has an absolutely atrocious record in terms of women’s representation in national decision-making,” she said. 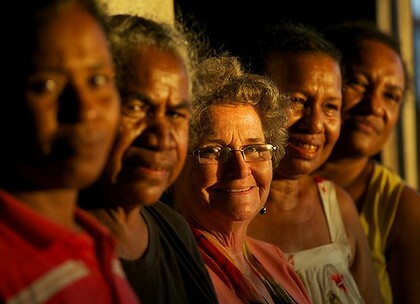 Former MP Dame Carol Kidu (c) with women from Port Moresby. The move follows a similar campaign in Papua New Guinea to reserve 22 seats in parliament for women, and a call by women in Vanuatu to boycott male candidates in this month’s elections. Ms Chetty says the move in Fiji would be a temporary measure, to deal with the country’s massive gender imbalance in power. “We feel that we’ve been under represented for far too long, and this is not the time to be playing it coy and asking for 10 per cent here or 20 per cent there, but rather to state very clearly what we want to see,” she said. The Constitution Commission will submit a draft to a Constituent Assembly in January, with the new constitution drawn up before the country’s national elections, scheduled for 2014. Ms Chetty says the current process is the perfect time to map out how Fiji brings more women into decision-making roles. “Where we’ve seen it happen most successfully is where there have been temporary special measures for women in decision-making,” she said.